Unless you are a car enthusiast or are one of the few civilians that can open the hood of a car and can name any of the numerous alien parts found in that Pandora’s Box, going to a car mechanic is one of the most horrible experiences. Right up there with dentists and taxes. Since 2001 I have not owned a car, and that lack has been even more adorable after my experience in Atlanta, GA where I owned a very used, $2,000 VW Jetta that broke down every other month. I found a 5-foot, arms-like-stones mechanic that talked loud and fast and from whom I never understood what was wrong with my car, other than it required hundreds of dollars to be fixed. This mechanic, however, wore a uniform and worked for Midas. I felt somewhat assured that this was the equivalent of going to a Genius in the Apple store. And it is this sense of security and confidence — and the reason for my long-winded story — that Goodwrench has strived to instill in GM owners since the late 1970s when it launched its Goodwrench program where all dealers of Chevrolet, Buick, Pontiac, Oldsmobile, Cadillac and GMC cars had to meet a level of efficiency and knowledge to fix all the cars that would inevitably need fixing. To help ease the pain of this experience, Goodwrench introduced Mr. Goodwrench, a feel-good fella who assured you that your car would be in good hands and back on the road in no time. And through the 80s, Mr. Goodwrench did its job and more, entering the lexicon as someone that could fix anything, not just cars. 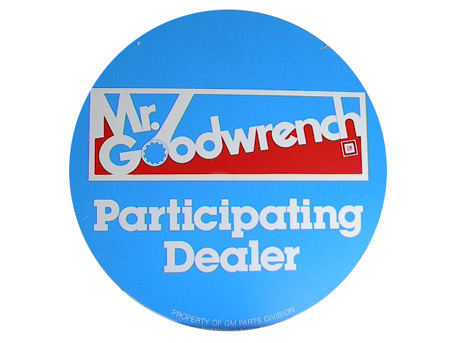 Even, in a less flattering turn, Mr. Goodwrench became slang for men’s private parts. 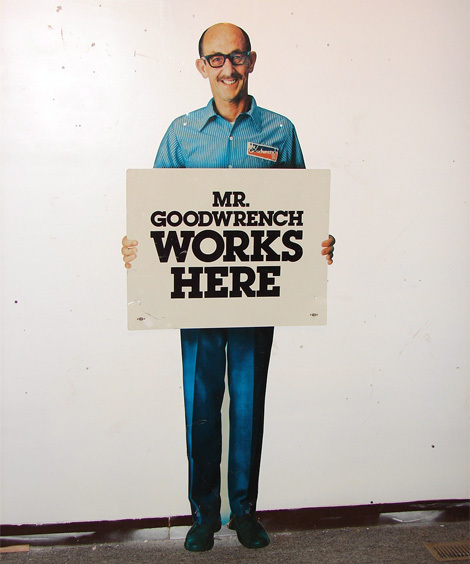 During the early 90s, Mr. Goodwrench faded away and the actual mechanics became the Mr. and Mrs. Goodwrenchs, despite Tim Allen making an attempt to step up to the role. In 2003 before Stephen Colbert was überfamous, he helped Goodwrench bring back the legend of Mr. Goodwrench by starring in a series of advertisements that had him looking for the elusive mechanic. The ads also helped extend Goodwrench’s involvement in NASCAR. But as cars have gotten more advanced and less prone to break down for mechanical reasons and more likely to do so because a computer chip somewhere in there would falter, it came time for Goodwrench to update their look. The new identity is decidedly forward-looking and up to date. Perhaps a little too much, but reflective of the new inner workings of the car. A now cliched power button insinuating a “G” is the new icon and a workhorse-looking typeface — a modified Klavika for those interested — replaces the equally hardworking Futura, keeping the a quirky “e” in there for old times’ sake. While I do not particularly like the icon, I find the typography extremely appropriate, as it continues the tradition of using a tough-looking typeface. See the chunky slab that Mr. Goodwrench is holding above, and the sweet, nostalgic logo below. 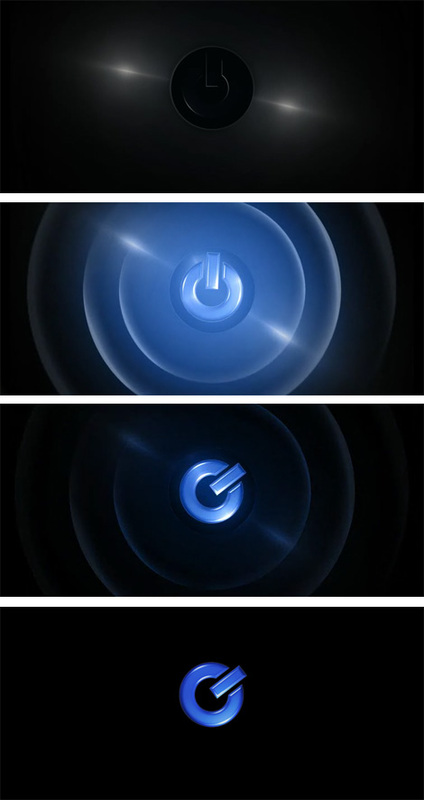 As pointed out in Typophile and other sites, the logo is too close to the ubiquitous Quicktime logo, but I wouldn’t consider this a case of plagiarism, just a lack of major originality. It will still be a while before I buy another car, if ever, but I would certainly trust a mechanic sporting this logo. Even if he (or she) talks fast and loud. Thanks to Doug Goodwin for the tip. \n\nUnless you are a car enthusiast or are one of the few civilians that can open the hood of a car and can name any of the numerous alien parts found in that Pandora's Box, going to a car mechanic is one of the most horrible experiences. Right up there with dentists and taxes. Since 2001 I have not owned a car, and that lack has been even more adorable after my experience in Atlanta, GA where I owned a very used, \$2,000 VW Jetta that broke down every other month. I found a 5-foot, arms-like-stones mechanic that talked loud and fast and from whom I never understood what was wrong with my car, other than it required hundreds of dollars to be fixed. This mechanic, however, wore a uniform and worked for Midas. I felt somewhat assured that this was the equivalent of going to a Genius in the Apple store. And it is this sense of security and confidence — and the reason for my long-winded story — that Goodwrench has strived to instill in GM owners since the late 1970s when it launched its Goodwrench program where all dealers of Chevrolet, Buick, Pontiac, Oldsmobile, Cadillac and GMC cars had to meet a level of efficiency and knowledge to fix all the cars that would inevitably need fixing.